The Improved SiriusXM Dealer App* allows your dealership to refresh SiriusXM radios in the vehicles on your lot simply by scanning the VIN with the Dealer App. Refreshing the radio will allow you to showcase SiriusXM and ensure your Pre-Owned customers drive home listening to their free SiriusXM Trial. Service can be activated 48 hours after the vehicle is placed into inventory, or at any time prior to delivery. *Enrollment in SiriusXM’s FREE Pre-Owned Program is required to refresh radios via the Improved SiriusXM Dealer App on non-certified factory-equipped Pre-Owned vehicles. Also available on factory-equipped CPO vehicles, where applicable. Refer to your specific OEM CPO Program for details. 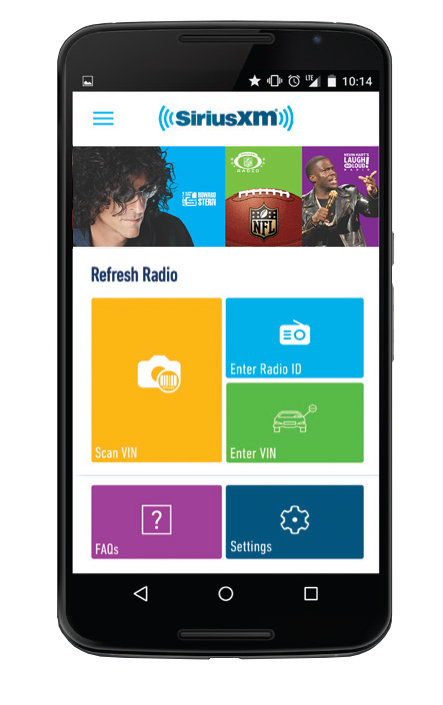 Launch the app and send a refresh signal to a radio’s ID by scanning the VIN or manually entering the radio ID. Find your radio by turning to Channel 0 or visiting siriusxm.com/activationhelp. Customer trial does not begin until after the vehicle is sold.